In the summer of 2014, I studied abroad in Innsbruck, Austria, as part of a law school program. Here are some things I did while staying in the Tyrol region. A group of students decided they wanted to do something more adventurous while staying in Innsbruck. We picked white water rafting. One of the women made the arrangements with Feel Free Outdoor Professionals. Feel Free is located in Oetz, Austria. Oetz is about an hour outside of Innsbruck. We had to take a train to Oetz and arranged for the someone from the company to pick us up from the station. We were a group of 5 women and our professor. That’s right, the professor who led all the hikes (check out my Hiking Around Innsbruck post). It was comical to say the least. It was no surprise that our guide decided to have us participate in a “trick” which inevitably flipped our raft and dumped us all out into the really cold water. Even in the summer the river was cold enough for us to have to wear wet suits. All you have to do is jump in right away, before getting into the boat, to acclimate. Otherwise, you’ll get splashed with water on the ride and will be uncomfortably cold. I’ve been white water rafting before in North Carolina and West Virginia. By comparison, the Ötztaler Ache River is pretty calm. We were never really in any danger of falling out (from rapids that is) and at times it was actually a relaxing float along the river. 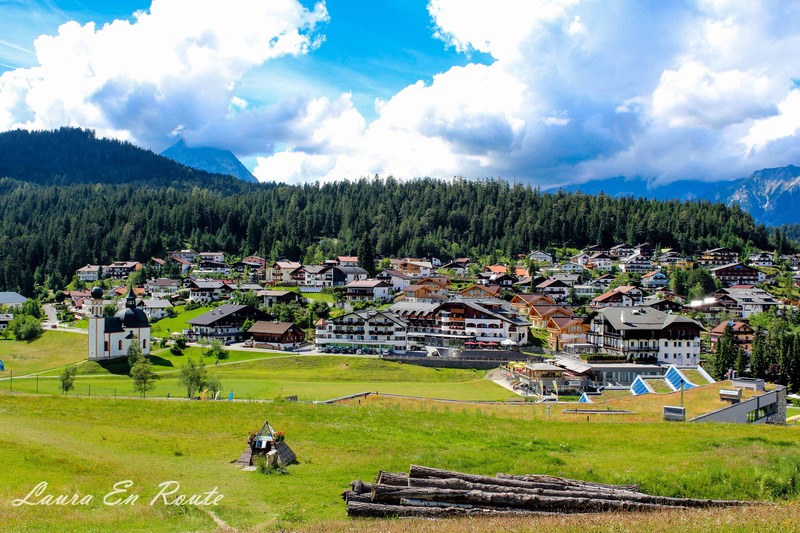 A small, ski town inside of Innsbruck, Igls is just a bus ride away and offers hiking, biking, swimming, and skiing opportunities (in the winter of course). Igls is where you’ll find one of the funiculars to the top of Patscherkofel. If you don’t want to hike to the top, you can take the Patscherkofelbahn and enjoy 360 views from the Panorama Restaurant. During the 1964 and 1976 Winter Olympic Games, Igls was the host for the luge competitions. If you’re visiting in the winter, you will find plenty of opportunities for winter sports around this Holiday Village. For more information on skiing while in Igls, visit this website. During the summer, you can soak in the sun while hiking the various trails, playing a game of golf at Olympia Golf Igls, or swimming in the nearby natural lake, Lanser See (Lake Lans). There is also the Kneipp Facility, a walk-in basin filled with water flowing from the mountain’s streams. It looks like a mini pool and has a place to fill up your water bottles before/after a hike. I stopped here after our Lanser See Hike to cool down. Igls was usually our starting point for various hikes. We didn’t have a chance to explore the village after our hikes since we usually had to get back to town for various events or dinners. I had planned to visit Igls the weekend I stayed in Innsbruck (instead of traveling to a neighboring country). Unfortunately, it rained the weekend I planned to visit Igls, so I had to change my plans to touring museums around Innsbruck instead. If you’re visiting during the summer and want to cool down, head out to Lanser See for a swim. You can walk to Lanser See from Igls. Even in July, the water is cold. But after sitting in the sun, without an umbrella, the cold water feels great. Or you can sit on the dock with your feet in and let the fish swim around you. For more information about visiting Lanser See, check out this website. A ski resort town about 35 minutes (26 km) from Innsbruck, Seefeld is a great day trip destination. Even if you visit during the summer, there are plenty of activities available in this beautiful Alpine town. You can take the train from Innsbruck. The station in Seefeld is across the street from one of the main shopping streets. Before walking too far around town, we stopped for a bite to eat and some beer at the Monghof building’s cafe. (You can check out the wintry street view on the Google Map link provided). After lunch, we strolled around the souvenir shops lining the streets. There’s also artisan shops. I purchased wooden Easter egg Christmas ornaments from one of the shops. I was tempted to buy a cuckoo clock but knew it wouldn’t fit in my suitcase (that and I couldn’t afford one). We then followed the street Pfarrhugel up Pfarrbichl hill (that’s a mouthful). A little “Sound of Music” ensued and then we stumbled upon the Way of the Cross. Below the hill is more of the village and a sports complex with a water slide! You can also still see start/finish-line posts from when Seefeld co-hosted the Winter Olympics. It’s no wonder that Seefeld is a destination for avid cross-country skiers. Near the finish-line, is a small church. The Seekirchl church is from the early 1600s. Closer to the main square, is the Parish Church of St. Oswald. It was a sight of pilgrimage in Austria and has several beautiful features inside. Before we had to catch a train back to Innsbruck, we bought some gelato at one of the cafes in the center of town and enjoyed the beautiful sunny weather. Another day trip I took from Innsbruck was to Neuschwanstein Castle in Germany. Check out my blog post on How to Visit a Fairy Tale Castle.